On a cold and blustery Wednesday, Henley Rowing Club again demonstrated that they are the one of the leading Junior Women’s clubs in the country with three commanding performances at the School’s Head. In the annual major event to end the Head season for juniors, the School’s Head of the River sees over 2000 junior rowers and scullers from around the UK compete on the tough four and a quarter mile course from Mortlake to Putney. 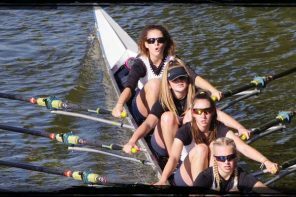 Henley Rowing Club entered races in all three age groups available, the WJ15 eights, WJ17 quads and Women’s Junior coxed fours. For the first hour of the race, the conditions were relatively calm. However, as the Henley boats were marshalled to the start, a fierce storm blew in from west London. This sudden and dramatic change in weather hit the first Henley boat as it crossed the start line, giving the WJ17 quad of Lauren Edwards, Maddie Orr, Ellie Thompson and Hattie Orr a real challenge to face ahead. With some crews having trouble steering in the strong wind, the Henley girls who normally race in their own age group as WJ16s, performed magnificently against the 19 strong field of older girls. The navigation of bow Lauren Edwards took the crew into the faster water, and they used the first half of the race to chase down the crews in front of them. Once beyond Hammersmith bridge the girls accelerated, relying on their superior fitness and sculling skills to challenge the older WJ18 crews competing in the event in front of them. Finishing at Putney in a time of 20 minutes and 56 seconds, the Henley girls won their WJ17 quad event outright with a massive 30 seconds ahead of the second boat, and only 3 seconds behind the fastest junior women’s quad of the day from the older girls at Gloucester Hartpury. 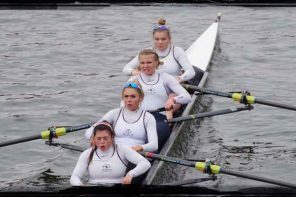 The second Henley boat to race in the worsening conditions was the WJ15 eight of Lauren Kay, Lily Stimpson, Florence Wiggins, Maisie Turner, Hannah Gutteridge, Georgia Edwards, Ella Morgan, Anna Roe and cox Rebecca Lister. With five of the crew still reeling from their Novice record-breaking success at the Women’s Head two weeks ago, the Henley girls were highly motivated to take on 14 boats from the rest of the country including old adversaries from Marlow Rowing Club and The King’s School Chester. The superior steering of cox Rebecca Lister was brought to the fore as the eight raced towards Barnes Bridge, and the Hudson boat carved through the waves to split apart the Marlow and Sir William Borlase boats ahead of them and plough through the middle to take the faster line. With parents braving the torrential rain to support the crew from Hammersmith Bridge, the eight took on the rousing cheers to carry them on the run to Putney, and finish in a winning time of 20 minutes and 18 seconds, 31 seconds ahead of the second placed Marlow boat who they had passed earlier in the race. The WJ15 boat, supported by Duncan McClure Fisher of Harpsden and Warranty Direct, was also the faster than all of the older WJ16 eights. It was also placed eleventh overall in the junior women’s eights category of 44 boats across all age groups, a magnificent performance by one of the youngest crews in the Head. The third and final triumph of the day came from the junior women’s coxed four. 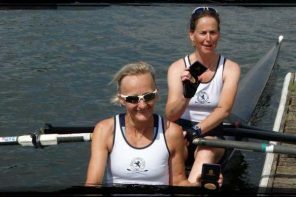 Even with the poor conditions, the crew of Ciara Buckley, Kryssie Steiger, Emily Pimlott, Alexis Perkins and cox Emma Lister, were keen to add another Tideway victory to their Four’s Head and Hammersmith Head wins earlier in the season. Completely unphased by the weather, the experienced crew raced at a low rate to ensure that they maintained their power through the gusting winds and torrential rain. The girls commanded the field, passing numerous crews easily and delivering a winning performance of 21 minutes and 45 seconds, nearly half a minute ahead of second placed Kingston Grammar School. The Henley coxed four demonstrated a magnificent victory over a field of 15 crews from around the UK and reinforced their position as the leading junior women’s coxed four. The three wins from three entries was the highest success rate of the day against the other girls clubs and schools racing, and confirms Henley RC as one of the top junior women’s clubs in the country. In other news, the growing Henley Rowing Club’s mens squad entered two boats in the Head of the River Race on Saturday. The annual event from Mortlake to Putney was stopped after 75 crews had passed the finishing line due to strong gusting winds beyond Hammersmith Bridge, making the river unrowable. The first Henley boat managed to survive the coastal conditions to finish at Putney in a respectable time of 20 minutes and 49 seconds. However, the Novice boat, primarily crewed by the Junior Men’s squad, was held at marshalling area and was unfortunately unable to compete due to the race being abandoned.